IIP for the month of Nov 16 is expected to be in the positive zone in Oct 16 largely owing to the base effect. Industrial production in the country continues to be plagued by weak investment activity, decelerating bank credit growth, weak external demand and lower capacity utilization rate. Besides the dent in consumption demand owing to demonetisation is also expected to impact production activity going forward. DnB expects IIP to have grown by 2.0%-3.0% during Nov-16. Price Scenario: While demonetisation is expected to pull inflation down as cash constraint impacts the prices of commodities, the impact will the transitory. Upside risks to inflation persists with increase in global commodity and crude oil prices, strengthening of dollar, US fed rate hike and downward pressure on the rupee. D&B expects the CPI inflation to be in the range of3.4%-3.6% and WPI inflation to be in the range of 3.2% - 3.4% during Dec-16, respectively. Money and Finance: Yields across maturities during Dec 16 is expected to be lower or at the same level as in the month of Nov16 owing to moderation in inflation. Also, given rise in bank deposits, banks are parking their funds in government bonds. However, the hawkish stance of both the RBI and the Fed would pull down the bond prices although in the near term. D&B expects 15-91 day T-Bill yield to average at around 5.9%-6.0% and 10-year G-sec yield at around 6.3%-6.6% during Dec-16. 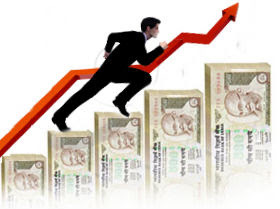 External Sector: Rupee is expected to remain under pressure in Dec 16. Uncertainty on impact of demonetisation, low productivity in parliament and ambiguity over the implementation of the GST on target date, uncertainly around global economy, OPEC decision to cut oil production along with strengthening of dollar will continue to exert downward pressure on rupee. DnB expects the rupee to trade in the range of around 67.70-67.90 per US$ during Dec-16.